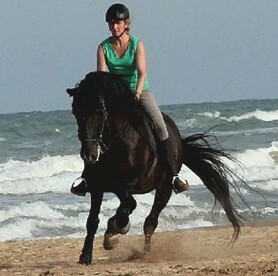 Discover the Costa Blanca on the back of a Spanish horse ! Our horse farm and riding stable "El Refugio" is located in the south of Valencia, about 35 km from Alicante Airport, between Guardamar and Torrevieja, and only 1.5 km away from the beach of the Mediterranean Sea. and we offer a wide range of riding programs. Our ranch is opened all year round, arrival and access to our various riding programs are possible at any time. Riding Guardamar: Even if you do not want to spend your complete holiday with us: You can still book riding lessons and trail rides - without room and board. Non-riders are also welcome to join us and to spend a holiday with full board in our guest house. 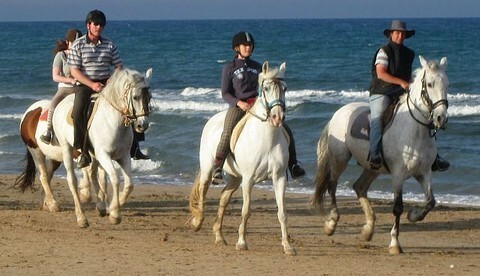 Enjoy riding on our well-trained and sure footed Spanish horses through the nature reserve of La Mata - Torrevieja. The two salt lagoons are among the most important wetlands in Europe with an exceptional climate and unique flora and fauna. It is the realm of avocets, cormorants and flamingos. Sandy, flat trails along the lagoons are ideal for scenic gallops. Our rides take you through orange and lemon groves, past vineyards, through pine forests, dunes and reeds. On stony paths we climb up the hills, from the saddle you will have superb views of the lagoon, the azure blue of the Mediterranean Sea and the sharply drawn silhouette of the mountains in the back country. Here it is possible, - exclusively for our residents and participants of our riding programs. Shorter stays over a long weekend or for 5 days are also possible. You want a special riding program (eg Spanish dressage) ? No problem, - just ask us !